Here is a fun recipe that has many flavor options if you are willing to experiment. 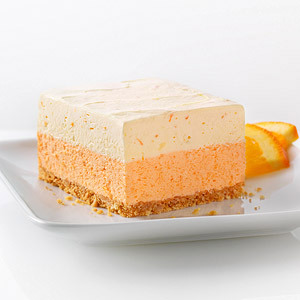 You can easily change the flavor of this dessert by substituting another flavor of Jell-O gelatin for the orange. Depending on the flavor you may not have to change the orange juice. However, you can try using apple juice, cherry juice, lemonade and other options to complement your gelatin flavor. You can also change the instant pudding flavor to French vanilla, cheesecake, banana or chocolate. MIX graham crumbs and butter; press onto bottom of 8-inch square pan. Refrigerate until ready to use. MICROWAVE juice in microwaveable measuring cup on HIGH 1 min. Add to gelatin mix in small bowl; stir 2 min. until completely dissolved. Gradually add to half the cream cheese in medium bowl, beating with mixer after each addition until blended. Whisk in 1 cup COOL WHIP; spread over crust. Freeze while preparing next layer. BEAT remaining cream cheese and milk in separate medium bowl until blended. Add dry pudding mix; beat 2 min. Stir in remaining COOL WHIP and zest; spread over gelatin layer. Refrigerate 3 hours.